Made in PICO-8 for #DemakeJam 2018, where the original build came 3rd Place. ...all within a single PICO-8 cart! 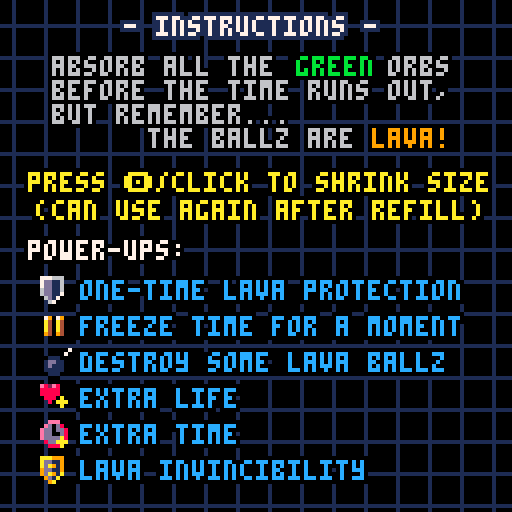 - ADD: Auto-save & Restore of progress, inventory, etc. "extcmd" does nothing in binary exports? Before you pull the trigger on v0.1.12 - can I ask whether you've enabled extcmd in binary exports? extcmd("screen")  -- works in PICO-8, not in binary export? Is this something that could still be rolled into the next version? "In today's world of modern home security, Santa's job of delivering presents gets tougher every year!" Created as part of PICO8 Advent Calendar 2018, organised by @Bigaston. Sensitive sound monitor - remember to keep quiet! This game was created for the PICO-8 Advent Calendar. Everyday during the month of December, you can play a new free game created with PICO-8. Santa is relying on you to sort the presents to the correct destination tube. Presents sorted incorrectly will lose points. Dropped presents will lose a life! but now finished and re-entered into @egordorichev's "Christmas Jam"
My entry to the 3-Color Jam (#3CJam), where you had to create a "spooky" game that used no more than 3 colours (and yes, Black is a colour!). It is an attempt to make a short adventure game, based heavily on the movie "Halloween" by John Carpenter. Simply use the cursor and (left) click where you want the player to Walk To. To interact with objects, click on the Verb you wish to perform, then click on the object. For example, to Pick-up the Knife... simply click "PICK-UP" and then click on the "Knife" object in the scene. When hovering the cursor over objects, their default verb/action (if applicable) will be highlighted. In this case, you can simply Right-click on the object for the default verb/action to be performed. Additional design by Hilda Nicholas. * [b]CHG[/b]: Now only offers hint once you've looked at a certain object. This was my entry to the #LOWREZJAM, using a display of only about 1/8th of the Pico-8 display (64x32 pixels), is a new spin on an old classic! Water tentacles: Don't linger too long next to the pool! Worms: If they sting you, it's game over! Soldiers: They will use all their skills to defeat you! AdventureJam returns for its third year of game development pandemonium as anyone with a computer, an idea, and an internet connection is invited to create an adventure game over the course of 14 days! Whether you love point & click adventure, text adventure or exploring 3D environments, we want you to jump in and create a game that embodies the spirit of adventure, whatever that means for you! Adventure games have been around nearly as long as computers, and what began with words on a black screen has evolved into an amazing spectrum of gaming experiences. Let's celebrate the awesome legacy this genre has created with 14 days of pixels, puzzles, parody and pathos! AdventureJam will begin May 5th at 9:00 PM EST, and end precisely 14 days later on May 19th 9:00 PM EST. The voting process will follow immediately after the jam concludes, and will last until June 16th at 9:00 PM EST. So GET LAMP... GET SWORD... and GET READY... for AdventureJam! 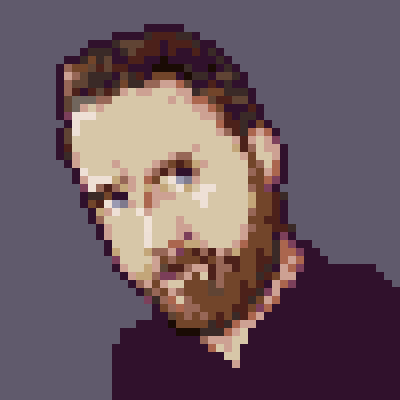 SCUMM-8, my point & click adventure game engine for Pico-8, has been included on the list of Resources. SCUMM-8 is a PICO-8 "demake" of the SCUMM engine that powered most of the classic LucasArts adventure games, such as Monkey Island and Maniac Mansion. However, it is only (heavily) "inspired" by the SCUMM engine, not a true replica - for that you'll want good ol' SCUMM-VM. My plan was to make it possible for anyone to make their own point & click adventure games in PICO-8! The above "game" is just a silly demo that I created as part of testing the engine. Unfortunately, due to the large size of the engine + game code, it had to be "minified" to allow posting to the BBS. The original demo game source can be found here (link). Please see the SCUMM-8 Wiki (link) for details on how to get started creating your own SCUMM-8 game, as well as the the full API reference. * [b]FIX[/b]: "Walking to Object, then clicking diff Verb does latter"
Does anyone know if it is possible to take some string content and convert it to functional/executable code in PICO-8/Lua? I have LOTS of objects (tables) that all have their own, unique functionality. So unfortunately, there's little potential for sharing data/functions. 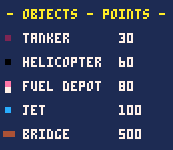 name = "my object #1"
But as I don't need all these objects to exist at the same time (and could REALLY do with saving some tokens! ), I'd like to somehow store these objects + functionality, e.g. within strings. Then at a later time, restore these back into true objects/tables again. local my_stored_func = "function()  -- code specific to this object here...  end"
I've seen similar potential methods of serialising/deserialising from strings - but at best it seems all I could store would be simple object properties (strings, numbers). Whereas the real benefit for me would be if the whole object (or at least the object's functions) could be string-ified. Again, I'm pretty sure I'm asking for the impossible, but if anyone has any suggestions that could help - I'd be very grateful to hear them! TINY RIVER RAID is my submission to TRASEVOL_DOG's excellent "Tiny-TV" jam. River Raid was my favourite game growing up with an Atari 2600, so I've tried to do my best to honour the original (quite tough with only 10x11 pixels!). All levels are procedurally-generated, just like the original. So in theory, the game is endless! • Look out for ships, helicopters, jets and oh... hitting land! • Finally... don't forget to COLLECT FUEL by flying over Fuel Depots before you run out and crash! I've even included four possible prizes to select from, should you reach the top! Hope you enjoy it - I spent WAY too long on what was supposed to be a "quick game to learn PICO-8"